It was a marvelous golden day to be in the garden and if I couldn't spend time in my own, then spending time at Owl's Hill with a group of nature lovers was the second best thing that could happen. Owl's Hill is a 160 acre nature sanctuary and their mission is conservation, restoration, research, and species protection. (here and here) Set among the rolling hills of Williamson County, on land that was heavily farmed for hundreds of years, Owl's Hill founders set about almost two decades ago to restore the land to a natural habitat. There are enormous 300-year-old trees, vestiges of the great eastern deciduous forest that once covered Tennessee, among the pioneer trees, seasonal wildflowers and ponds and wetlands. Owl's Hill is home to more than a dozen amphibian species, 125 species of birds and almost all the mammals found in Middle Tennessee. It is also the site of my Tennessee Master Naturalist classes...Lucky me, I was accepted into the second training session and over the next ten months the class lessons will be touching upon the major components of Tennessee's natural biological systems. You couldn't ask for a better place to study nature. Saturday was bug day! To be accurate, it was pollinators, predators, pests and parasitoids day! Steve Murphree, a Belmont University professor gave an excellent and informative talk and then we headed out to the garden of native plants. After all, that's where all the flowering plants and critter action can be found. So join me in a Bloom Day celebration of a few of the marvelous flowers in bloom at Owl's Hill (a few of the critters we saw, too) and don't forget to stop by May Dreams Gardens and take the Mr Linky magic carpet ride to more gardens than you can imagine seeing in one day! Verbesina alternifolia was blooming all over the place! When I say blooming all over the place, I mean it was a major player along the pond where it has the moist soil it prefers. More often known as 'Wingstem', it was marvelous and golden against the blue skies. I don't know about you, but, I have a special place in my heart for rough and tumble wildflowers and these rough looking golden flowers really fit the bill! Also in bloom is a close relative, Verbesina virginica. It's another of the rough and tumble wildflowers that has captured my heart! It's known as 'Frostweed' because of the unique frost flowers that develops on cool mornings (Have You Seen The Frost Flowers and Frost Flowers Blooming the Garden), but, there's more to these beauties. They are true pollinator magnets. They bloom for an extraordinarily long time and attract every pollen and nectar seeking moth, skipper, soldier beetle, honey bee or bumble bee. That's a lot to get from a flower. Don't you agree? If your heart is open to rough and tumble wildflowers, I have another flower to share! This one may surprise you, although, not my good friend Frances of Fairegarden...She feels the same way about them. Thistles were making a beautiful and dramatic statement in the wilder places at Owl's Hill. They were stunning in the sunlight and utterly and completely charming to look at. Yes, I did use stunning and charming to describe thistles! They were. I fell for their good looks when I saw them standing tall among a field of Solidago, Verbesina, Asclepias and Vernonia. I am guessing they might be Circium muticum, a biennial that grows in moist fields. But, the name matters not, their real charm required an up close and personal look into their beautiful rose pink flower faces. They were lovely and the flower heads were quite soft, and bees, beetles, skippers and other critters crawled in, on and around with ease. I will suggest that if you want to get close, that you be careful where you hold on to the stem, they are thistles after all. PS If you live in Middle Tennessee, call Owl's Hill to make an appointment to stop by and see the wildflowers and the owls! Yes, they have owls! Dear Gail, this class is so perfect for you! 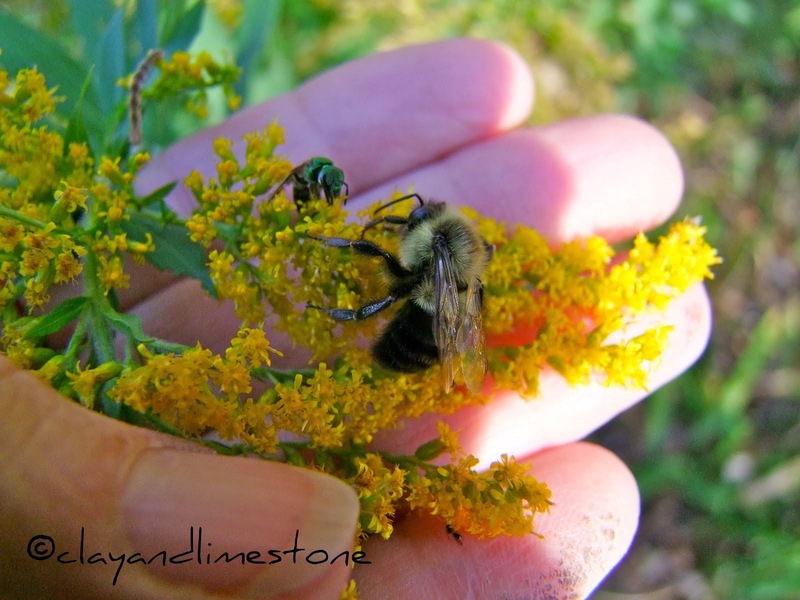 Someday maybe you will be the instructor, for your interest and support of the pollinators is unmatched. What a pleasant surprise to see the linkage and the thistle, of course covered in happy flying friends. Thanks, my dear. Owl's Hill sounds like a wonderful place. The goldenrod et al were in peak performance in the fields and roadsides this weekend, what a sight to see. What a wonderful place. You are a great fit for the Naturalist Course. Love seeing these wild places. Happy GBBD. Just spectacular. What a fabulous place, and terrific photos too. Thank you...I do believe that you live in a marvelous part of the world! Is verbesina a southern native? I don't think I've ever seen it, and we have plenty of wet fields. I really appreciate you sharing you journey with us...you are an inspiration on many levels. Hi Gail, I am almost to ask why it is called Owls' Hill, when you suddenly answered it at the end. That place is certainly haven for small creatures, as well as photographers. 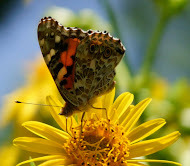 How beautiful that area can be, and butterflies seem to be unafraid of humans! It's a wonderful refuge. I wish you could see it. It has cultivated and wild garden areas...both show off our native beauties wonderfully. Gail girl hello there ! What a gorgeous place that must be and are there truly owls there ? did you see any? I wonder if they HOOT at night : ) I would love to hear that ! You caught some gorgeous bugs and flowers .. it is like they all know this is going to wrap up soon, so they better grab all the nectar and pollen possible. What a meadow!! Just beautiful. Think the Master Naturalist class is a perfect fit for you. It's a beautiful meadow and very typical of Middle TN...Have you been to Shelby Bottoms yet? It's a great walking, biking and if you can skate trail! I've been seeing these everywhere. In fact someone asked if about wingstem on PPSMT. I did not know what it was at all. So glad you identified it and the frostweed. They are gorgeous this year. I know you were in heaven on Owl Hill. What fun! Of course you got in, they probably want you to teach the next native pollinators class. Happy GBBD! Les, that's very kind, but, there are real experts teaching the class. I like Thistles, too, especially when they're in a wildflower field. Thanks for sharing your day in that special place. The butterfly shot on the shoulder is sweet! She was a butterfly and critter magnet all day...Thistles in a field are beautiful, not so much in a small garden bed. What a beautiful classroom! The photos are gorgeous and certainly show the pollinators' affection for these wildflowers. Love the photo of the gray hairstreak hitching a ride:) I agree with the other commenters that this class seems like a perfect fit for you and that you could probably teach some of the sessions! Gail how wonderful to be part of this class and to explore this wonderful place...the flowers and meadows are gorgeous. I have thistle in my meadow too...ouch is all I can say as I pick the teasel out from between the thistle. I think thistles are really pretty and I know some birds love the seeds, but I am happy to say that I think my grandsons and I did such a good job on thistle patrol that I no longer see them in my fields. Lots of other bird food, however! Pat, I haven't any in my garden either...not enough sun. Owls Hill is a paradise. It's like Eden. I was dreaming of having my house built in the middle of a place like this. Excellent photography. I can almost smell the fresh air. That is an amazing place. The frostweed is great. Obviously enjoyed by all. What a fantastic place to have nearby Gail. It looks like pure heaven for all. I've noticed a lot of pollinators on thistles here too but I still don't think I'll plant any in the garden!! (although I think the blooms are quite lovely) The closest will be more artichokes ~ which many pollinators enjoyed here this summer too. Great photos. I know you're glad it's almost October ~ hope you get many beautiful days to be out in the garden!